One of the most scenic areas of the Lake District National Park, the Borrowdale valley stands at the south end of Derwent Water. The River Derwent runs along the valley floor, and on all sides rise up dramatic fells. This glorious walking country, and immensely popular; not surprising given the variety of both easy and more difficult trails available. 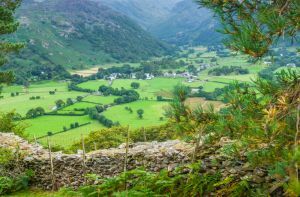 Borrowdale is the most heavily wooded area in the Lake District - which, to be fair, is a relative feature, as the park as a whole is sparsely wooded! The area has a long history of mining, and the Honister slate quarry is still active around Honister Pass, high up above the valley. The National Trust maintains ownership over large areas of Borrowdale, and far up into Derwentwater, and does its best to preserve the scenic beauty and heritage of the area. The Trust very early on recognised the heritage value of the area, and Brandelhow Park in Borrowdale was the first area of land purchased by the Trust in the Lake District. Watendlath and Surprise View - OS: NY276163. One of the classic Lake District views is from Surprise View, looking over Derwent Water to Keswick and Skiddaw. The road to Watendlath leads to a remote farm and a hanging tarn. Brandelhow - OS: NY254206. The first Lake District landscape purchased by the National Trust. There are lovely trails along the water, with superb views to the neighbouring peaks. Derwent Water - OS: NY263223. This beautiful lake stretches from Keswick in the north almost to Grange and the Jaws of Borrowdale in the south. There are National Trust parking areas on the east shore (they get busy, so arrive early). To the west of the lake is Catbells, a low peak providing one of the best easy walks in the park. Force Crag Mine - OS: NY199217. The last mine to close in the Lake District. The mine opened in 1839 and operated until 1865 although it was worked intermittently until it was permanently closed 1991. Visitors can view the processing mill and the historic collection of mining gear. Castlerigg Stone Circle - OS: NY292237. Immediately east of Keswick is this enigmatic stone circle, set in a stunning location in a bowl of fells. Without doubt one of the most beautifully situated prehistoric monuments in Britain. Parking is always an issue in the Lake District (which is a polite way of saying that it can be a major challenge to find a place to park). The National Trust maintains parking areas at these locations in and around Borrowdale. Free to Trust members unless noted. Location: Follow the B5289 south from Keswick. The road winds through Borrowdale and over Honister Pass.